LIFE is one of the main EU financial instrument supporting environmental, nature conservation and climate action projects throughout the EU. The programme exists since 1992, it has co-financed some 4306 projects and, for the 2014-2020 period, contributes approximately €3.4 billion to the protection of the environment and climate. LIFE is therefore a major source of lessons and inspiration, including for cooperation on the green economy, considering the programme experience in areas such as green jobs promotion and support to SMEs in the circular economy. The general objective of LIFE is to contribute to the implementation, updating and development of EU environmental and climate policy and legislation by co-financing projects with European added value. LIFE began in 1992 and to date there have been four complete phases of the programme (LIFE I: 1992-1995, LIFE II: 1996-1999, LIFE III: 2000-2006 and LIFE+: 2007-2013). The LIFE multiannual work programme for 2014-2017 has a budget of €3.4 billion in current prices, offering opportunities for growth and jobs in Europe, with a global market for eco-industries estimated at roughly €1.15 trillion a year in 2010 and possibly reaching €2 trillion a year by 2020. For 2014-2020, the LIFE programme has two sub-programmes: the sub-programme for Environment and the sub-programme for Climate Action. The ‘Environment’ strand of the new programme covers three priority areas: environment and resource efficiency; nature and biodiversity; and environmental governance and information. The ‘Climate Action’ strand covers climate change mitigation; climate change adaptation; and climate governance and information. The programme also consists of a new category of projects, jointly funded integrated projects, which operate on a large territorial scale. These projects aim to implement environmental and climate policy and to better integrate such policy aims into other policy areas. The new regulation establishes eligibility and the criteria for awards as well as a basis for selecting projects. The programme is open to the participation of third countries and provides for activities outside the EU. It also provides a framework for cooperation with international organisations. During the four first phases of the programme (1992-2013), LIFE has co-financed about 4000 projects across the EU, contributing approximately €3.1 billion to the protection of the environment. LIFE Environment across nine environmental themes promoted product and management innovation and demonstration. The environmental effects of LIFE Environment were mainly local. LIFE Third Countries assisted mainly local environmental authorities in 16 beneficiary countries to modernise environmental administration. The programme achieved added value by improving the implementation of EU environmental policy at national, regional or local levels and by providing EU-wide exchange of information. The Nature & Biodiversity strand, representing around 51% of the action grants budget, helped adopting management plans, restoring valuable habitats, recovering emblematic species and developing the Natura2000 network. It also helped creating collaborative platforms that enhance partnerships thereby facilitating the transfer of best practice between stakeholders and decision-makers. The biodiversity projects contributed to combat invasive alien species, promote green infrastructure or the role of agriculture in preserving biodiversity. 30 NGOs were selected in 2007, 33 in 2008 and 32 in 2009 for support under the NGOs operating grants, with a good balance between policy development, policy implementation and capacity building, making a necessary contribution to EU policy. Public procurement was used to complete studies and evaluations, to hold meetings, workshops and seminars or to develop and maintain computer systems (e.g. the LIFE website or the Natura2000 information system). This intervention was also used to assist the Commission with information, publication and dissemination activities central to its objectives. The current LIFE Programme (2014-2020) is also a driver for green skills and jobs. The programme, now in its 25th year, has fostered skills development and created sustainable jobs in many sectors of the economy. This is happening at all skills levels - from highly-qualified architects, chemical engineers and ecologists to skilled manual labour (e.g. builders, ship dismantlers, park wardens, aquaculturalists) to low-skilled labour in centres for reuse and recycling. Many of the new jobs in cities are linked to the circular economy. LIFE projects are contributing and demonstrating potential of the transition to a circular economy to create jobs and upskill the workforce. A study published by LIFE in 2017 demonstrates the programme’s considerable impact on job creation and growth. The study found that for an initial investment of €2.1 billion, LIFE has contributed an estimated €9.3 billion to the European economy. It also showed that in addition to direct contributions to employment and growth, LIFE Nature projects have a ‘hidden’ added value in terms of ecosystem services (e.g. providing us with clean air and water, flood protection, climate stabilisation, and recreation and eco-tourism). The average LIFE project was found to create 31 person-years in full-time equivalent (FTE) jobs: 21 directly and the rest indirectly. Therefore, 1 000 projects would create a total of 31 000 jobs during project implementation, with at least 43 500 more jobs in the five years after the start of project replication, based on the most conservative replication scenario used. The Natura 2000 network of protected areas also contributes to social and economic goals. The network of 28 000 sites has safeguarding Europe’s biodiversity as its primary aim. Indirect employment linked to the Natura 2000 network includes activities for which sites are catalysts, such as eco-tourism, or support services for conservation and downstream activities such as pro­cessing fish, using timber, or making honey. The Natura 2000 network has been estimated to support 104 000 jobs directly, and a further 70 000 jobs indirectly, with LIFE playing a fundamental role. LIFE Nature project restoration work involves many job types and skill levels, from manual labourers to graduate professionals. LIFE has frequently enabled the return or con­tinuation of appropriate low-intensity traditional farming or forestry - jobs that depend on the ecosystem services they are helping to maintain. The LIFE programme has funded nearly 2 000 projects directly or indi­rectly related to the water sector. These projects have extended along the water cycle, from the management of groundwater and water resourc­es – including wetland and river restoration - to industrial wastewater treatment. They have developed green skills and created jobs, ranging from manual work for socially disadvantaged people to highly-skilled technical positions. To alleviate water scarcity LIFE projects have de­veloped new skills in groundwater management and remediation. Creating highly-skilled technical jobs in areas such as water quality, sanitation, and urban and industrial wastewater treatment is a positive side effect of LIFE’s core activities. Innovations in water supply funded by LIFE, including a novel filtration system for drinking water developed by the AFM (Advanced Filtra­tion Management) project, have led to skilled and highly-paid technical jobs for quality control specialists, engineers and industrial chemists. The LIFE programme has contributed to the spread of green jobs and skills in cities in a host of areas. 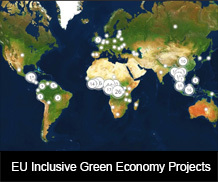 Projects relating to the circular econo­my are already a motor for job creation in areas ranging from innovative production processes to waste upcycling to starting real markets for secondary raw materials. Perhaps the greatest impact in terms of developing green jobs and skills has been in waste management. LIFE has created a positive symbiosis between nature and enter­prise is its support for organic city farming. It has helped restore agricultural land around cities by connecting agricultural schools and agrono­mists to citizens, often with no previous farming experience. These newly-skilled urban farmers have set up in business to supply locally-grown produce to city-dwellers. As well as creating new jobs, such projects boost cities’ green infrastruc­ture and resilience to climate change. LIFE Nature and Biodiversi­ty projects in particular have benefited from the ability of nature conservation NGOs to leverage their networks of volunteers. LIFE projects have traditionally involved volun­teers in everyday conservation and restoration work, such as monitoring, tracking, wardening, ground clearance and planting. The experience of volunteering can help people learn new skills, many of which are not only useful in the workplace toda, they are appli­cable to the greener economy of the future. (d) countries which have become members of the European Environmental Agency in accordance with Council Regulation (EC) No 933/1999 (1). LIFE PROJECT “DYEMOND SOLAR” (Sweden) - Innovative Technology for Low Cost Production of Energy Efficient Dye-Sensitized Solar Cells has facilitated kick-starting of the Swedish solar technology company EXEGER, which develops and produces novel printable solar cells for use in consumer electronics, on buildings and in other applications. EXEGER's long-term strategy is to enter multiple solar markets, including consumer devices, smart homes, and building integration. The company's solar cell technology excels in indoor illumination, is flexible and aesthetically superior to existing commercial technologies, allowing the company to target the consumer electronics market for seamless integration into a variety of devices. LIFE Green Sinks (LIFE12 ENV/IT/000736) has produced marketable green composite sinks substituting organic and mineral primary materials by recovered waste. LIFE In-BRIEF - Integrated business model for turning Bio-waste and sewage sludge into renewable energy and agri-urban Fertilizers (LIFE14 ENV/ES/000427) turns old Waste Water Treatment plants into energy sources. LIFE LEMA - Intelligent marine LittEr removal and Management for local Authorities (LIFE15 ENV/ES/000252) works towards providing solutions for cleaning up marine litter. LIFE RE-WEE (LIFE14 ENV/GR/000858) reduces Waste from Electrical and Electronic Equipment (WEEE) through prevention and reuse. The project demonstrates efficient sorting and preparation for reuse processes for a variety of WEEE, leading to an increased acceptance of Used Electrical and Electronic Equipment (UEEE) by the consumer. The catalyst effect of LIFE+ projects improves the implementation of nature policies in the Member States. The LIFE programme represents a significant support for eco-innovation for both the private and the public sector. The clarity of the guide for applicants, especially by providing more examples of types of projects suitable under the strands, improves the overall quality of submitted projects. More flexibility in the geographic scope of the funding helps prevent the trade-offs encountered, especially regarding transboundary environmental problems beyond the EU. Moreover, it lessens the negative impact on the international dimension of NGOs work. For public procurement, it increases the capacity to carry out communication activities, such as international events, outside the EU. supporting long-term economic viability and stability by promoting sustainable development.